Did you know that Panter’s Home Design and Flooring offers some of the best hardwood refinishing services that Corona homeowners and business can get in this area? 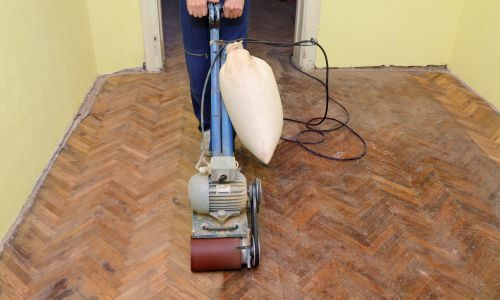 For more than 25 years, we have been assisting our customers with a variety of flooring issues, and one of those issues is when they come to us needing their worn, dull wood floors brought back to life. So, why come to Panter’s Home Design and Flooring? It should be noted right from the start that all wood flooring will lose its luster over time. This is normal, and homeowners and business owners should not be alarmed by this. Even engineered wood flooring will become dull. This is just a fact of life. But, this does not mean that those dull floors have to stay dull. Not when we can bring our professional hardwood refinishing service to your home or business and give those floors a brand new look and life. Hardwood refinishing is both a skill and an art. It can take years to become a true expert working with wood flooring, and our refinishing technicians have that training and experience. Using modern equipment, along with their expertise, brings about the best possible results. Results that homeowners and business owners can be proud of! It should also be noted that not everyone who says they can refinish your hardwood flooring can do so at a professional level. Hardwood refinishing is both a skill and an art. It can takes years to become a true expert working with wood flooring, and our refinishing technicians have that training and experience. Using modern equipment, along with their expertise, brings about the best possible results; results that homeowners and business owners can be proud of! In addition to resurfacing your flooring, our techs will also repair any damage to your wood floors such as denting, cracks, chipping, and other minor repairs. When they are finished, you will be hard pressed to even find the area that was damaged. If you have wood flooring that is dull and worn, visit with us at our showroom in Corona, CA and talk to us about our services. We also serve the areas of Eastvale, Lake Elsinore, Riverside, and Rancho Cucamonga. See Panter’s Home Design and Flooring when you want the best hardwood refinishing services in town.